SAN FRANCISCO (July 31, 2018) – In advance of the Global Climate Action Summit in San Francisco, the Exploratorium is hosting a month-long series of events about the world's oceans, focusing on ocean health and the Exploratorium's partnership with NOAA. Ocean Discovery Month will highlight programs and partnerships that help us communicate environmental and climate science to the public, and to connect our community to scientists, artists, and policy-makers working on the most pressing environmental problems of our time. During the month of August, visitors to the Exploratorium can take part in Ocean Discovery Month, a robust series of programs and events related to ocean health, climate change, and awareness of the underwater ecosystems that make up seventy percent of the surface of our planet. "We built the Observatory on the edge of San Francisco's waterfront, not just for the beautiful views, but because it offers an excellent entry point into investigations of the local landscape, and of our human impact on that landscape," says Susan Schwartzenberg, senior artist at the Exploratorium and director of the Fisher Bay Observatory, a 6,000 foot indoor and outdoor space with a view that looks out on Treasure Island, the Bay Bridge, and the expanse of water below. The month-long series of events and programs will be more than an opportunity to talk about the oceans; for visitors interested in exploring the underside of a carbon buoy, boarding a NOAA research vessel, hearing firsthand stories of whale rescue, looking at ocean critters with origami microscopes, or talking to students and researchers traversing the once ice-clogged Northwest Passage, Ocean Discovery Month offers activities that are exhilarating and hands-on, as well as being significant opportunities for learning. "A lot of visitors to the Exploratorium don't realize that in addition to our exhibits, we have ongoing partnerships with institutions such as NOAA, UC Davis, and UC Santa Cruz to educate the public on environmental science," says Mary Miller, science writer and director for the Exploratorium's partnership with NOAA. "We collect carbon dioxide levels and other data related to climate change right here on our campus that feeds into international databases to better understand the impact on urban environments." In the past few years, the Exploratorium has hosted conversations between artists, designers, policy-makers, scientists, national and international experts, and the public, to discuss and investigate environmental change in the Bay Area and beyond. "We've found that this space has become a kind of town hall for San Franciscans interested in connecting with the world to discuss how we might cultivate a more resilient waterfront community," says Schwartzenberg. "Ocean Discovery Month is a chance for us to share these ongoing conversations with the greater Exploratorium community." Notable recent collaborators and speakers at the Exploratorium's Fisher Bay Observatory include the Port of San Francisco Seawall, Resilient by Design, Drew Caputo and Andrea Treece of Earthjustice, and Giovanni Seminara, emeritus professor of fluid dynamics and co-designer of the MoSE system, which protects Venice from high tides. For Ocean Discovery Month, the Exploratorium will host Elizabeth Rush, author of Rising: Dispatches from the New American Shore. Visitors interested in attending multiple events during Ocean Discovery Month might want to take advantage of the Exploratorium membership: for less than the price of three individual daytime tickets, members can visit the Exploratorium all year long, receive member communications and discounts at the store, and get special access to members-only events. There will also be two Ocean Discovery Month membership events in August, including a Buoy + Breakfast Member Morning on August 8th where members can enjoy a free breakfast while talking with scientists and exploring the underside of the NOAA buoy, and a members-only tour of the Reuben Lasker, NOAA's research vessel that will be docked at the Exploratorium from August 9th to August 13th. The Exploratorium hosts Ocean Discovery Month as the City of San Francisco prepares for the Global Climate Action Summit, an international gathering led by Governor Jerry Brown to discuss worldwide commitments and accelerated action to mitigate climate change. "Now is the time to focus intently on our relationship to the environment," says Chris Flink, Executive Director of the Exploratorium, "and to bring people together to explore possibilities for the future. Because of our home on San Francisco's waterfront, and our expertise in communicating complex science in a way that is exciting, confidence-building, and personal, the Exploratorium is well positioned to be a part of this conversation about environmental science education and awareness." 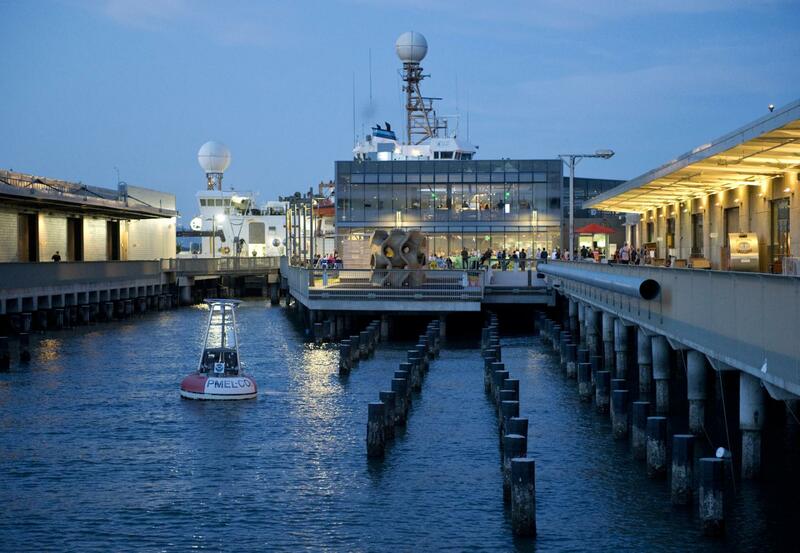 Celebrate Ocean Discovery Month this August at the Exploratorium, and explore your connection to the ocean through daily hands-on activities, ship tours, conversations, interactive exhibits, and more. Daily, August 1-31, 2018 * 10:30 a.m. and 3:30 p.m. Discover the Bay's plankton through a powerful microscope at the Bakar Explainer Station twice a day during Ocean Discovery Month. Wednesday, August 1, 2018 * 11:00 a.m.-12:00 p.m.
Join Exploratorium biologist Jennifer Frazier for a tour of Exploratorium ocean exhibits that explore what plankton are, where they live, and how they change with the environment. Thursday, August 2, 2018 * Noon-1:00 p.m.
Join Elizabeth Rush, author of Rising: Dispatches from the New American Shore, for a discussion about coastal communities undergoing dramatic transformation due to climate change. Thursday, August 2, 2018 * 6:00-10:00 p.m.
Trampolines, pogo sticks, kids on road trips: bouncing isn't just about jumping up and down but describes an object's change in motion after encountering an obstacle. Rebound your curiosity in collisions at After Dark: Bounce. Wednesday, August 8, 2018, 9:30 a.m.-10:00 a.m. Discover what's inside–and what creatures live on–a scientific buoy as we raise the one that bobs in the Bay between Piers 15 and 17. Light refreshments will be served. Wednesday, August 8, 2018 * 10:00-2:00 p.m.
Take a close look at the critters and seaweed that colonize the bottom of the buoy when we pull our NOAA CO2 buoy out of the water for its yearly servicing. Thursday, August 9, 2018 * Noon-1:00 p.m.
Join Exploratorium biologist Jennifer Frazier in a demonstration with living plankton in the Bay. Thursday, August 9, 2018 * 6:00-10:00 p.m. Humans have smoked meats and fish since prehistoric times. At Pairings, learn the differences between hot and cold smoking and explore some distinctive regional delicacies inspired by these ancient preservation techniques. Friday, August 10, 2018 * 5:30-6:30 p.m.
Join Exploratorium staff member and NOAA-trained entanglement responder Kathi George to learn how responders approach and save entangled whales. Saturday, August 11, 2018 * 10:00 a.m. and 3:45 p.m.
Saturday, August 11, 2018 * 10:15 a.m. to 3:30 p.m.; tours starting every 15 minutes. Special members-only tours at 10:00 a.m. and 3:45 p.m. Climb aboard a U.S. fisheries research vessel–the Reuben Lasker–to learn about its ongoing survey of deep-sea fish populations along the West Coast. Sunday, August 12, 2018 * 11:00 a.m.-3:00 p.m.
Wednesday, August 15, 2018 * 11:00 a.m.-12:00 p.m.
Wednesday, August 15, 2018 * Noon-1:00 p.m.
Bring your lunch and hear from Exploratorium staff and collaborating scientists about the connections between San Francisco Bay and the ocean. Friday, August 17, 2018 * 5:30-6:30 p.m.
Meteorologist Brian Garcia demystifies the iconic San Francisco summer fog, and explains why the ocean is key to forecasting the weather in San Francisco. Saturday, August 18, 2018 * 1:00-4:00 p.m.
Wednesday, August 22, 2018 * Noon-1:00 p.m. Learn more about how changes in the ocean can affect the health of San Francisco Bay from oceanographer Kate Hewett. Friday, August 24, 2018 * 5:30-6:30 p.m. Learn more about how scientists deploy saildrones, wind-powered drones for ocean research in places too dangerous and remote for humans. Saturday, August 25, 2018 * 11:00 a.m.
Scientists and filmmakers pair up to quickly write, direct, and edit a movie that compelling tells the story of climate change. Sunday, August 26, 2018 * 1:00 p.m. and 3:00 p.m.
Join a live discussion with scientists and students on an icebreaker in the Arctic as they explore how marine ecosystems and wildlife are responding to melting sea ice and climate change. Wednesday, August 29, 2018 * Noon-1:00 p.m.
Bring your lunch and learn more about a powerful new marine technology at Pier 17 that tracks harmful algal blooms in the Bay. Live Ship Chat from the Arctic Wednesday, August 29, 2018 * 2:00 p.m.
Thursday, August 30, 2018 * 2:00 p.m.
Thursday, August 30, 2018 * 6:00-10:00 p.m. This film by Tessa Ellie Schmidt looks at the complicated but beautiful flurry of activity that happens in Sitka, Alaska each spring when herring arrive to spawn. Friday, August 31, 2018 * 1:00 p.m. and 5:30 p.m.
Sunday, September 2, 2018 * 1:00 p.m. and 3:00 p.m.
Monday, September 3, 2018 * 1:00 p.m. and 3:00 p.m.
Sunday, September 9, 2018 * 1:00 p.m. The Exploratorium is a playful learning laboratory at the apex of science, art, and transformative education with a historic impact on the innovation ecosystem of the San Francisco Bay Area and the world at large. In addition to a renowned collection of interactive exhibits that ignite curiosity and build confidence and science-literacy, the Exploratorium is home to a diverse contemporary art portfolio, an extraordinary teacher-training program, and a museum development team whose impact reaches from the Golden Gate Bridge to Palestine. Open Hours : Open 10:00 a.m.-5:00 p.m Tuesday through Sunday; 6:00-10:00 p.m. every Thursday night (ages 18+). Closed Mondays except select Monday holidays. Easily accessible by BART and Muni. Ample parking nearby and advance parking available. For directions. For tickets and pricing information.